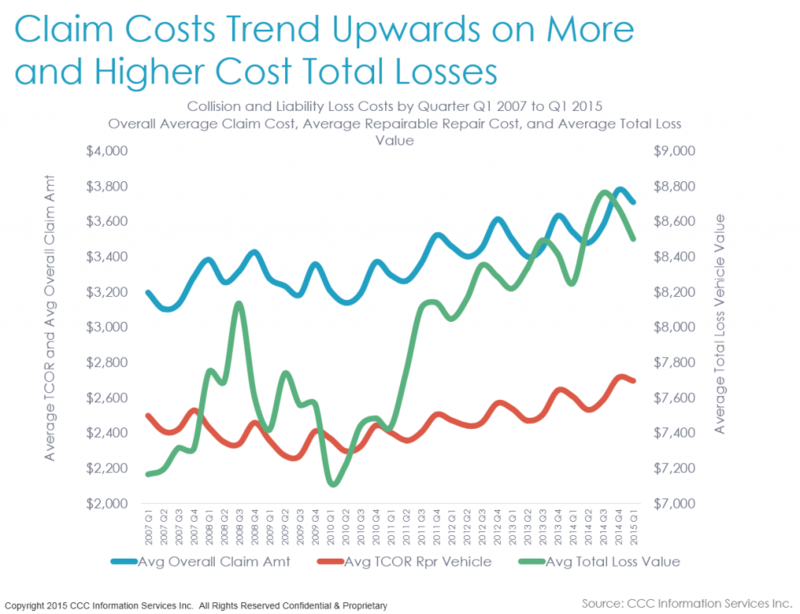 We and others have made much of how slick new driver assistance options are likely to elevate future collision repair bills, but CCC observed this week that the explosion of standard features also drives claim and total losses. 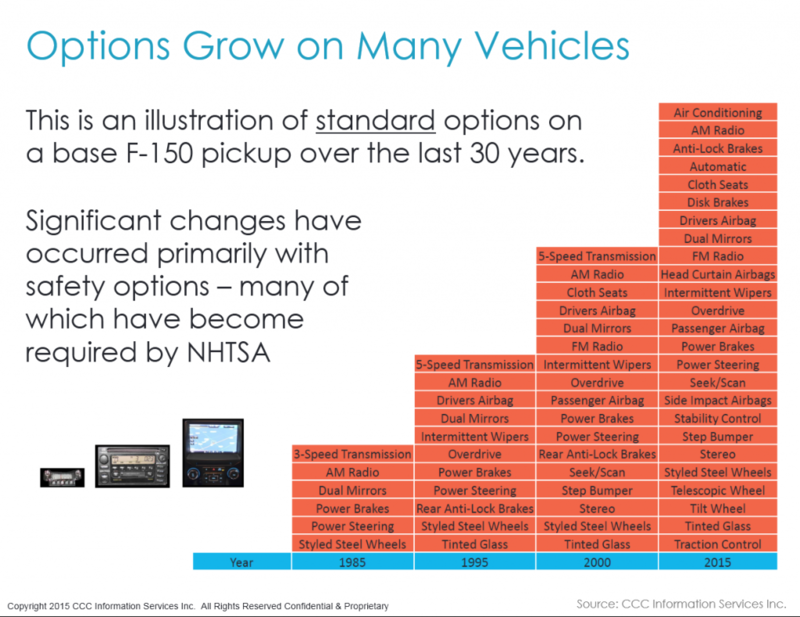 CCC analyst Susanna Gotsch on Monday gave examples of three non-luxury vehicles to show how “standard options” (you’ve got to love that oxymoron) have grown in the past decades. The 1989 Hyundai Sonata GLS had 23 standard features, but the 2014 Sonata nearly doubled that to 44. The 1995 Honda Odyssey offered 29 items standard; the 2015 Odyssey has 52. “And while the 2015 Ford F150 has been in the spotlight for the introduction of its aluminum body panels, the base model for the F150, has seen significant growth in the number of standard options over time,” Gotsch wrote. A CCC chart showing F-150 standard features is pretty staggering, showing how much better drivers who don’t upgrade anything have it. The 1985 F-150 had five items standard: a three-speed transmission, an AM radio (FM wasn’t even standard a decade later), dual mirrors, power steering and brakes and “styled steel wheels,” according to CCC. Some of the growth in “standard options” were driven by safety standards, according to Gotsch (airbags, for example). 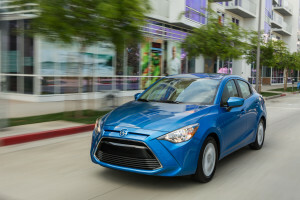 Others which on first blush seem like silly manufacturer hair-splitting — AM and FM are really considered separate options for the 2015 model year? — actually show how spoiled we’ve become as drivers. But for a repairer or insurer who has to install or pay for these things, they do add up, both in parts revenue and labor hours for a repairer and a higher bill for insurers. Which is why you just total the car and move on. Average January-March repair costs for a vehicle at least 16 years old were $2,395, while total losses would average $3,095. “As repair costs rise across all vehicle ages, older model year vehicles (which now make up a larger share of overall claims volume) will quickly reach the point where the repair cost exceeds the total loss threshold, and those vehicles will be totaled,” Gotsch said. Of course, total loss prices are also driven by strong demand for used cars, Gotsch noted. It’s getting to the point where the high-tech stuff is standard too. Rear-view cameras will be required by the feds by 2018, and automakers are already announcing braking assistance (alerts and “pre-braking”) or flat-out automatic braking itself either standard or cheap.